You Rope The Horses Feet? Why rope your horses feet? Well, it’s not how we catch them. This video shows one of our training methods. Using a rope around the feet teaches the horse to let you handle their feet safely. It also prepares your horse for those unexpected situation where a leg gets caught in briars or a fence. We usually start with a soft rope that can be loosed quickly and easily. Once the horse accepts the process, we use a lariat or whatever is handy. The horse in the video is one we have mentioned before. 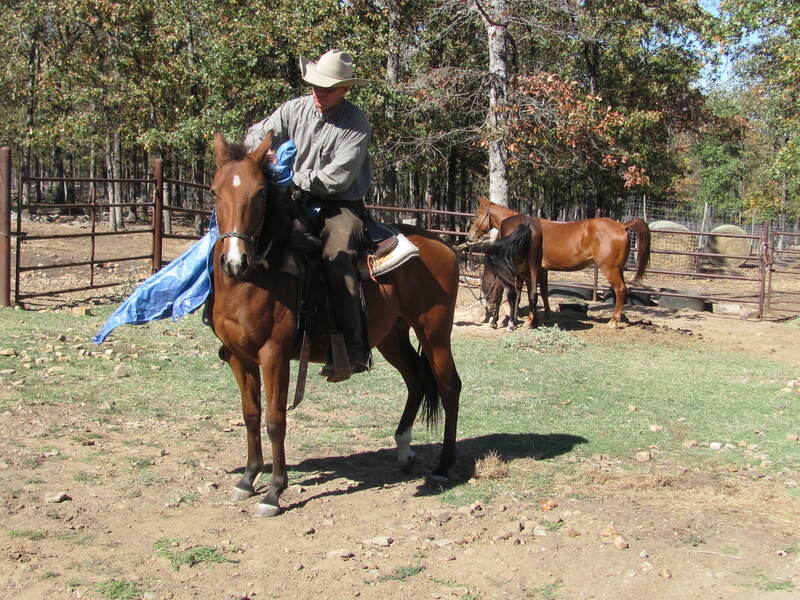 Although Montana is an excellent little mare, every horse on the ranch is handled the same way. We want our horses to know how to react if they suddenly find a foot caught or tangled in something we didn’t see. AQHA requires all stallion owners to file a report identifying the mares bred by the horse. The deadline is November 30th. AQHA has made the process simple and allows the owner to file it online. The staff at AQHA is willing to help with any questions by telephone or e-mail. If you like to use paper for your business, you can print the report and mail it. Failure to timely submit the report can result in late fees. Deadline is nearly here. Get to it! Horse Listening provided the top 1en ways not to buy a horse. It is a good reminder of the mistakes we have all made along the way. If you are looking to purchase your dream horse, avoid the mistakes the rest of us have made. We read with some interest a debate between two veterinarians over whether you should keep a horse in a stall. Dr. Thomas R. Lenz and his wife are both veterinarians and disagree over the proper way to maintain a horse. We are not veterinarians, but have owned a few horses over the years. We seen the temperature in our Bixby, Oklahoma ranch reach 121 degrees Farenheit in the Summer and minus 28 degrees in the Winter. We have seen the snow so deep the truck was stuck for a week with drifts 4 feet deep. We have young horses and old, some over 30 years. These horses are maintained in the pasture with sheds. They receive plenty of hay and fresh water along with adequate salt. The old geldings we have in retirement are so old they don’t have any teeth. The eat twice a day and get only store-bought horse feed with water to soften it. These guys have lived long lives and always been happy living in the outdoors. Like we said recently, horses aren’t people. Trying to give them human attributes and needs is okay to a point, but then it really should stop. Letting a horse live in the great outdoors is not mean, it’s ideal. We have a bit of disturbing news for some folks; horses are animals. Yep, it’s true. Horses are not human and never will be. Don’t get us wrong, we really like horses and LOVE to trail ride! Sometimes a good horse makes better company than humans, especially if you aren’t in the mood to talk. And sure our horses come up to the gate to have their head rubbed and ears scratched. We unfortunately have a world of people who learned most of what they know about horses watching cartoons and movies. The entertainment industry has created a myth that horses are your friend. We aren’t saying your horse can’t offer companionship or give you some moral support once in a while. Just don’t get to thinking they are human. They just aren’t. To believe your horse thinks like you do is just an accident waiting to happen. Horses respond differently, think differently, and have different needs than us. If you forget this distinction, it will get you or someone else hurt. Some of the worst horse accidents are caused by a horse that is essentially spoiled and one day decides to throw a temper tantrum. You don’t have to be kicked or bit many times before you understand what we are trying to say. Part of our job is to educate and some folks aren’t going to like everything we try to teach. Chances are that someone from the cartoon generation will read this post. They may truly believe horses are our friends. We can only hope they will give some polite consideration to a life time of experience we have around these creatures. As much as we like ’em, they are still just animals. P.J. 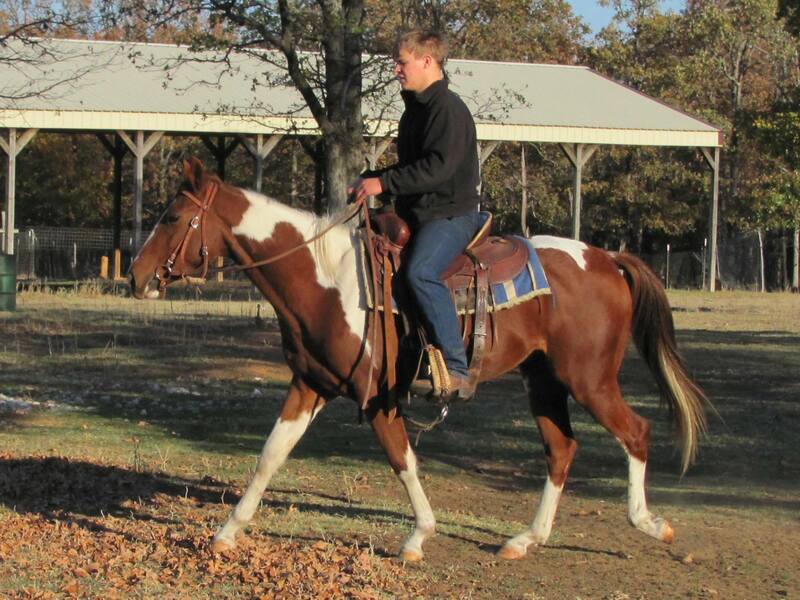 is a handsome looking APHA registered gelding just starting our two-year training program. He moves nice and has a smooth gait. He has a good mind and really likes people. Some folks would call him a “pocket horse” because he is always in your pocket. We have high hopes for this young gelding. Aside from his striking color, he has cow horse blood lines going way back. While we like a horse that is easy to look at, the bottom line is performance. If a horse doesn’t have the mind, temperament, and athletic ability to get the job done, then good looks are worth much. P.J.’s got it all. 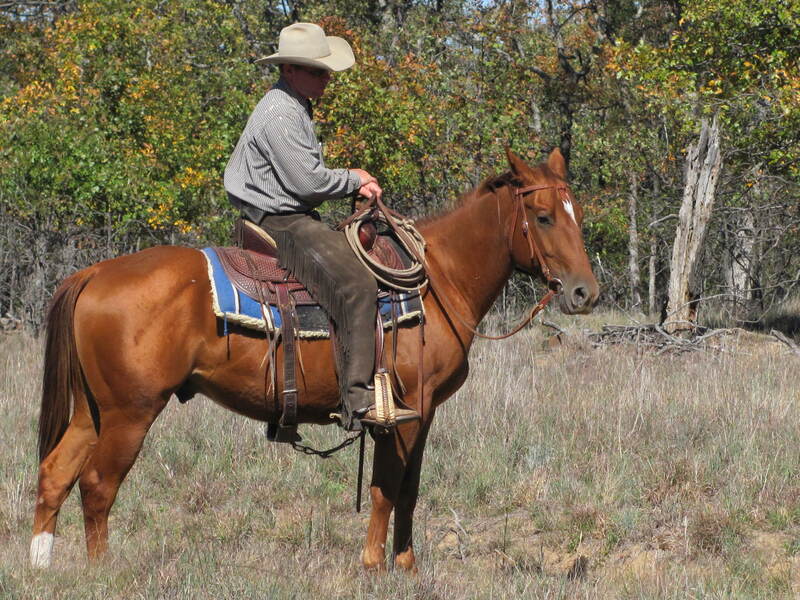 We’ll update you on his progress as he continues his education on how to be a great trail horse. Graduation Date: November, 2014. Click here to check out what PJ has been up to! Montana is shown in this video dragging an empty 55 gallon barrel over the gravel and rocks. She accepts the job without fuss. A lot of horses would panic with a loud, clanging object following them. Montana, like the rest of the horses that graduate from our two-year training program are exposed to all sorts of fun chores. We like to have young horses drag the barrel for several reasons. It is fairly light, but just heavy enough to pull on the saddle horn especially when it hits stumps and rocks. It makes a lot of noise so the horse learns not to become excited just because a noisy monster is chasing them. Young horses like Montana don’t need to pull a lot of weight in early training, but do need to learn pulling is part of the job. Tex is still too young to really ride, but it won’t be long until we can start riding him. Just under 2 years old. he doesn’t have the bone structure to handle the weight. In the meantime, he has been ponied miles and miles with a saddle. He has learned to stand patiently while tied and has been taught some general manners such as personal space. We like our space and don’t want to find a horse standing on our foot. The photo shows Tex getting used to the tarp. This was the second time mounted. He was only ridden for 4 or 5 minutes and we wanted to find out how the tarp would affect him. He was bored with it and looked at us like this is silly. Bear in mind, we had been working with him using the tarp from the ground and he was used to the idea. Tex will have a head start on a lot of horses by all of this pre-training experience. 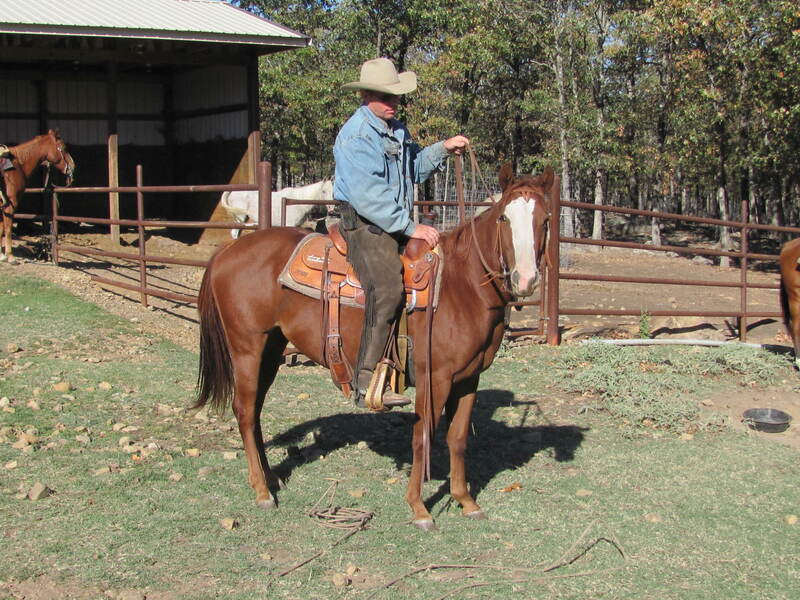 We anticipate Tex will be neck reining, backing, and capable of light trail riding in about six months. By the time he is old enough to ride, he will have been exposed to more than a lot of horses experience in 3 or 4 years. Tex will do well. We will keep you posted on his progress. He is going to be keeper. Montana is an AQHA registered quarter horse mare. She has been handled by us since a baby. We started leading her around and playing games real early in her life. We used to cover her in feed sacks while she was eating and then put flat rocks all over her back. She got used to a lot of aggravations at a young age and learned to patiently accept almost anything. Montana is about as calm as they come. She hasn’t been under saddle all that long, but has done exceptional. Although she is not scheduled to graduate until May, 2014, she stands when mounting, loads and unloads from the trailer, and handles livestock. She has successfully completed tarp training, crosses bridges, water, and been ridden along the highway. We think Montana is truly remarkable. So special that we decided to breed her and raise a colt while she completes her trial riding education. She just has those working cow horse genetics nothing can beat. Click here to check out what Montana has been up to! Chex is another AQHA registered quarter horse in our two-year training program. He looks a lot like Jack and Speck. If you don’t look close, you can find yourself riding Chex when you thought you saddled Jack. He’s nicely put together and well-muscled. Chex is a quiet horse and doing really well, although he hasn’t been under saddle for long. As you can see, he stands patiently and waits to move until asked to go forward. He is easy to load in the trailer and started dragging logs and 55 gallon barrels. With a smooth gait and a pace covering walk, Chex is good for the trail. He has all the wonderful attributes of a foundation bred quarter horse and will be able to do nearly anything when he graduates. We will give you updates on Chex as his training continues. He is set to graduate August, 2014. Click here to check out what Chex has been up to! It is my pleasure to meet you, my name is Jack. 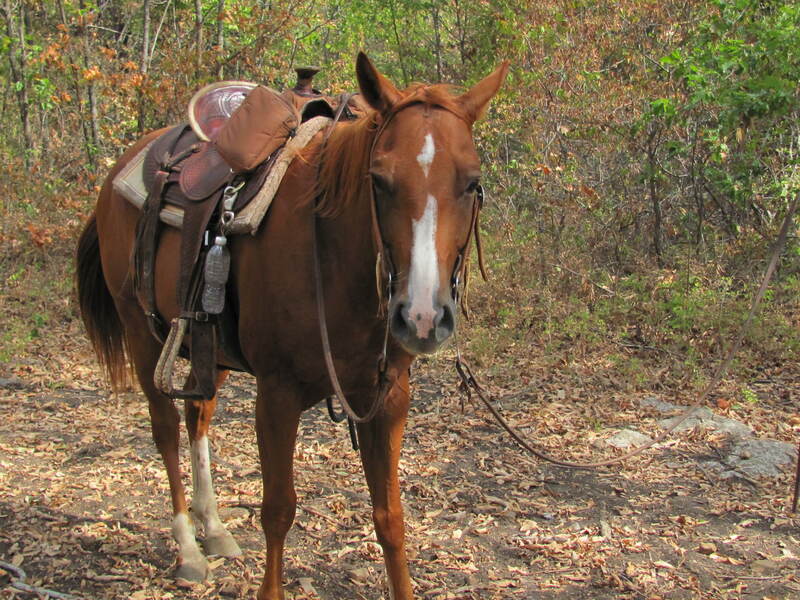 I am an AQHA registered quarter horse in the two-year trail riding program and plan to graduate in May, 2013. Trails are fun to me, I like to see new things and enjoy the opportunity to go places. In my training, I learned how to neck rein, load and unload from the trailer, how to ground tie, and to keep my feet under me on the trail. I have been ridden a lot and covered many, many miles in all sorts of situations from rescue operations to helping monitor wild fires. The training program has really expanded my natural abilities and a lot of hours were spent working livestock. I can pull tires, logs, fence posts, 55 gallon barrels, and have ponied a lot of other horses. I am not afraid of a hard day’s work and don’t mind getting a little dirty. My trainers say I’m an all around horse that can do anything I am asked. The trainers seem really pleased with my calm attitude and willingness to do the job at hand. My grades have been good and I plan to graduate and move on to full-time work with a great owner. I am looking forward to lots of fun and good times when I start my next job! Come see me some time and scratch my ears – I really like that. Click here to check out what Jack has been up to! You are currently browsing the horsesfortrail blog archives for November, 2012.